Last year I dug up a section on one side of the front lawn. I desperately need some full-sun garden space and I finally decided that I’ll grow a few vegetables in the front yard. After all I think a tomato plant can be just as beautiful as any other ornamental plant. Last spring I spent a few hours each day for a few weeks digging up the many sapplings that grew in half of it and the sod that grew in the other half. Last summer I grew a cover crop of crimson clover in this new garden area to amend the soil (which is really bad, lots of clay). It was both beautiful and beneficial, the bees loved it (as did the deer when they found it). This spring we worked up the soil and were pleasantly surprised by the great job one crop of crimson clover did for the structure of the soil. I planted onions in one section and the other will be filled with tomatoes, basil and peppers when the weather warms enough. I have now gained about 120-140 sq ft of full sun garden space. My tomatoes and onions should do wonderfully this year in the new sunny are of the garden. This fall I plan on using a cover crop of winter rye in this area of the garden to further improve the soil. I have another area about 5 ft wide and about 20 ft long covered with a tarp to kill the grass so I can liberate even more lawn into edible and beneficial garden space. Each year the lawn gets smaller and the gardens get bigger. Have you expanded your garden space recently to accommodate more edible plants? I harvest my first vegetables from the garden yesterday of seeds that I planted this spring. We’ve been eating lettuce, spinach and a few other items from the garden for a month or two, but those were all planted last year or are perennials. 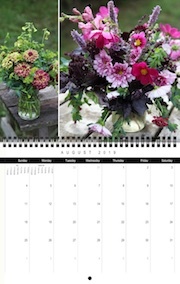 I sowed some ‘Pink Beauty’ radishes and arugula on March 17 in the cold frame. I’ve been watching them bulb up and finally I decided to pick a few yesterday for an afternoon snack. It’s been six weeks since I planted them. I have been planting radishes every 3 weeks in hopes of having a nice harvest of them constantly this spring. I’ll be harvesting the arugula soon, I’m super excited about this as it’s my favorite green. 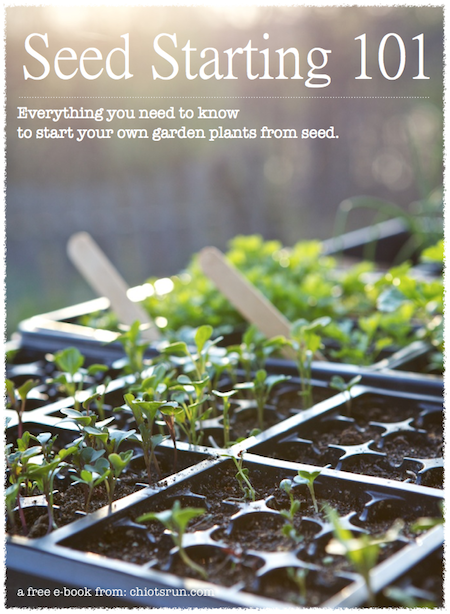 Have you harvested any veggies from seeds you planted this spring? The last tulips to bloom in my garden are my ‘Mickey Mouse’ tulips. Normally I don’t like red and yellow flowers, but I do love these. They’re a great send off to the blooming spring bulbs. Not long after they fade the peonies will start their show. So here’s to the tulips and the lovely spring show they provide us each spring. Enjoy these photos of the last of the spring tulips here at Chiot’s Run. What’s the last spring bulb to bloom in your garden? Several years ago Mr Chiots and I found our first morel. We’ve been gathering them and eating them or giving them away ever since. It’s always great when you can harvest from the wild that you don’t have to grow yourself, especially when it’s something as expensive as morels. Last year the morels came out the day before we went on vacation, so we gave our harvest to my grandpa, who is a huge mushroom hunter. He’s even take vacations specifically for hunting mushrooms. Needless to say he was thrilled when we showed up with a pound and a half of them for free, no hunting involved on his part! It’s kind of funny because so many people we know have secret morel hunting ground. They won’t reveal their spot to anyone. We’re lucky because we don’t have to go much farther than our backyard for our mushroom hunting adventures. This past week was the week for morels here in our neck of the woods. We got a fairly good harvest, around a pound. I never pick them all, I always feel like I should leave a few for propagation. I also carry my harvest in a mesh bag, I’ve read this is the proper way to harvest mushrooms because then you disperse the spores when you walk around. The morels paired perfectly with a venison roast and all those tiny onions from my garden (which happen to roast up perfectly when left whole). I roasted the venison and mushrooms with a good marsala wine, some homemade butter and homegrown garlic. You just can’t get any more delicious for a foraged meal! My parents joined us because a good meal is always better when shared with company, and my dad’s the one that took Mr Chiots hunting for the first time last year. One of the things I’d love to learn more about is mushroom gardening. I love all kinds of mushrooms and would be a happy gardener if I could pick oyster, shiitake and lion’s mane mushrooms in my own back yard!